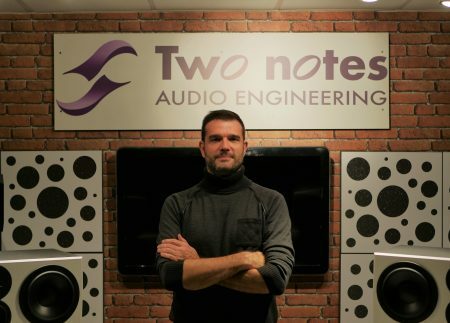 Guillaume Pille, owner and founder of Two notes Audio Engineering, recently discussed his views on the best impulse responses, the future of guitar technology and what he thinks about the recent partnership between Two notes and Celestion. Q: Could you start by telling us about the Two notes Wall of Sound plugin and how that came about? Ten years ago, Two notes released the first digital load box, which at the time was a very innovative product. We quickly realised that some of our customers wanted to use speaker and miking simulation technology with their DAW. I then decided a few years later – as a bonus – to offer the Wall of Sound plugin to people who owned Torpedo hardware. Q: When did Two notes first become aware of Celestion’s range of impulse responses? I remember at NAMM 2017, Celestion announced they were releasing digital versions of their speakers and I was actually surprised, because to me Celestion was an analogue brand. I found it interesting that such an iconic brand that helped write the history of electric guitar and bass was entering the digital market to offer more options to their customers. And they did it very well, because I think we can say now that Celestion have become the experts in impulse responses. There was a great reaction from their customers, as well as users of that type of technology and everyone is very happy with the impulse responses Celestion created. 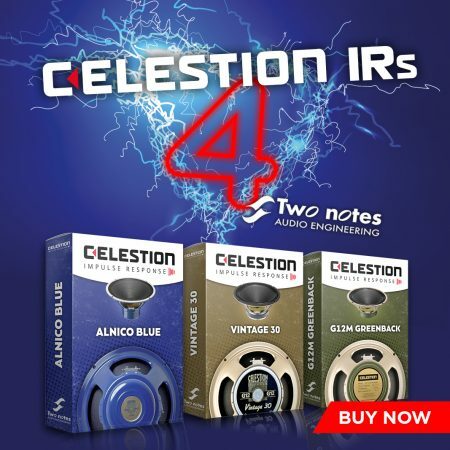 Q: Some Two notes customers have been using Celestion IRs for a while now. What made you decide to partner with Celestion specifically? And what benefits does this partnership have for Two notes customers? I think Celestion have done a great job of capturing IRs of their own cabinets and speakers. They’ve used the best studio and the best people to do that job – I was amazed at the awesome job they’ve done. At some point, our customers began to use the Celestion IRs with the Torpedo hardware series or the Wall of Sound plugin. However, at that time, what our customers were missing were some of the options that the Two notes proprietary format offers; for example, moving the mic in your virtual studio to the front or the back of the cabinet. Also, the Two notes technology can replicate the type of distortion you have when you push a cabinet really hard in a mic with a mic preamp. These tiny differences are what made us want to work with Celestion on this new, dedicated bundle of cabinets. It’s about creating a synergy between Celestion’s expertise in speaker design and what we’ve learnt about how to capture the best impulse responses to achieve the best speaker sim. Q: How do you think IRs are changing how guitarists make music? Recording an electric guitar or bass has always been about putting a microphone in front of a cabinet, but the problem with that is you can’t do it everywhere. You probably can’t do it at home because of noise, etc. – and nowadays you can’t even really do it properly on stage either, just because of noise and time issues. However, now you have many options to address that issue either with amp modellers or with the digital load box that we offer – and IR technology is just the last link of that chain to really replicate the tone you would have if you were cranking your amp in a really good studio room. I think using the digital technology to do the speaker and microphone simulation is probably the best option you can choose today. Q: What do you see for the future of impulse responses and tone simulation? Guitarists and bassists now have some great options that help address some of the issues associated with regular amplifiers and cabinets, such as weight and size. In the future, I think these technologies will evolve and get better and better and closer to the real deal. However, I think what people need is not about more zeros and ones. It’s not about more processing power, it’s about knowledge – how can I use this power I already have to achieve the tone I have in my head? So I think what we’ll see is some kind of smart software or smart hardware – designed to help guitarists achieve the tone they’re after more easily – and that’s what we all want. As part of Celestion’s goal to make our impulse responses available on as many different platforms as possible, three of our most iconic speaker IRs – the Alnico Blue, Vintage 30 and G12M Greenback – are now fully compatible with the Two notes Wall of Sound environment. Download our iconic IR packs today at CelestionPlus or at Two notes. You can also discover more about these impulse responses in Wall of Sound format in more detail at our recent blog.